Right now, Green Lake is one of only a few places in the world where you can design your own engagement ring or wedding band and have it cast in Fairmined certified gold; Fairmined is an assurance label that certifies gold from empowered small-scale miners who meet world leading standards for responsible practices (It’s much like ‘Fairtrade’ is for coffee). Several years ago, we looked at friends in the jewelry industry who’d gone to great lengths to incorporate it into their fashion lines and admired their resolve for ethical sourcing, but struggled ourselves to see how it might work here. After all, Green Lake crafts each piece to order for individual clients who’d have to support the added cost. Moreover, the workshop already uses 100% recycled noble metals – and doesn’t that do more good for the world than mining for new gold? Gold from the lathe in the Seattle studio. Green Lake is as much a recycling center as it is a workshop for fine jewelry. Our group of designers and gemstone buyers returned to Seattle with aspirations to do more than just make beautiful jewelry. In a small way, we could give our brides-to-be an opportunity to better the industry. Since then, we joined a growing number of certified jewelers, subject to biannual audits and accountable for our transparency in the way we use gold. Now we’re working Fairmined gold into custom pieces upon request, integrating with recycled platinum, upcycled diamonds and mine-to-market sapphires. The added cost of a totally Fairmined certified gold ring? It’s about one to two hundred dollars more for an average piece. Small-scale mining plays an important role in the local community. The 72 miners at Iquira in Colombia support approximately 450 people through their work. With increased income thanks to mining, the community has greater opportunities and an amplified long-term business vision. Is it ‘better’ to use Fairmined gold? Not necessarily. While all other Green Lake gold is still 100% recycled, we offer this option to clients interested in knowing the origin of their rings, as well as the opportunity to support ecological sustainability abroad. 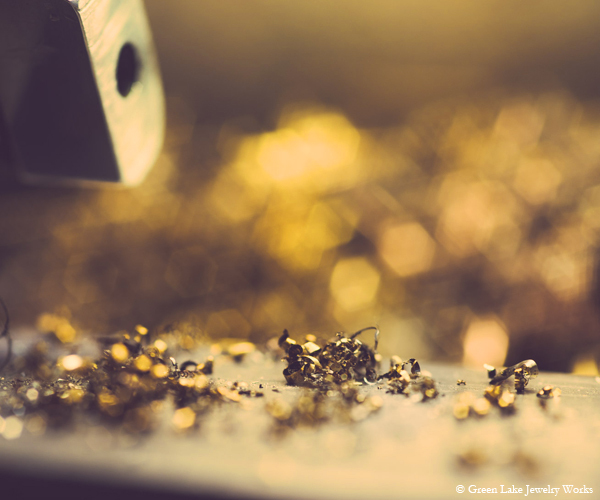 Where does Green Lake’s Fairmined certified gold come from? 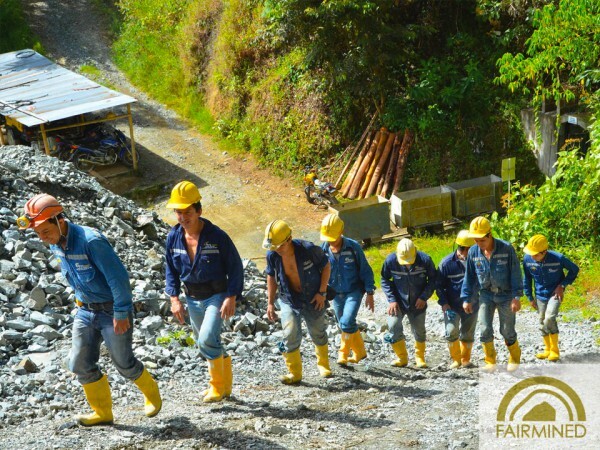 Green Lake’s Fairmined gold presently comes from mines in Colombia, Bolivia and Peru. Green Lake receives gold from an American refiner that mixes gold from these specific mines. In the next year, Green Lake will directly source Fairmined gold from a newly certified mine in Mongolia. Gold is cast in house at Green Lake by casters who’ve mastered the art. 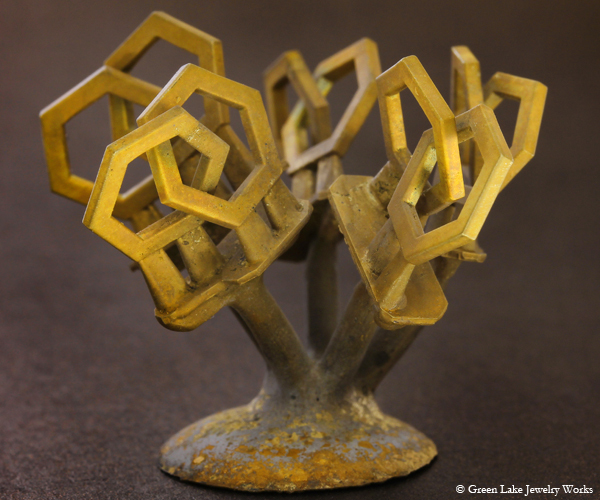 Pictured are hexagon pendants on a casting tree; the finished pieces were gifted this year to the Dream Foundation and Young Survivors Coalition at the annual Get Hitched Give Hope Gala. Are there any local mines that are Fairmined certified? There are no Fairmined certified mines in developed nations such as the United States, Canada and Russia as the label is only intended to support small-scale miners in developing regions. What alloys are available for Fairmined certified gold? Fairmined gold is available in 14 & 18ky, and Fairmined certified silver is available as well. White, rose and green gold alloys are not available because there are no accredited mines for the nickel or copper that lends gold those colors. Is there a Fairmined certified platinum? There is no Fairmined certified platinum as there are no participating mines in Africa, a region that supplies much of the world’s supply. Who else offers Fairmined certified gold jewelry? Some American designers of fashion jewelry have adopted Fairmined gold. However, Green Lake is one of the few custom bridal shops in the world to use it. As always, please contact us at info@greenlakejewelry.com for any and all questions!